It's summer and, unless you have full central air or a personal chef, it's time to give your oven and stove a break. In fact, the best part of grilling is that most of the preparation work is non-cooking work. Since the cooking is done outside, you can walk away from the heat and, maybe, catch a cooling breeze. 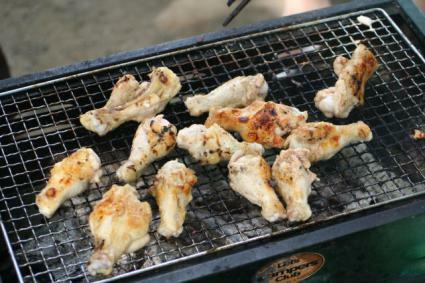 Once you have the grill good and hot, all you really need is some grilled chicken recipes and a cold beverage. There are specific ways to season your grilled chicken recipes. You can use a spice rub or you can cook them plain with just a touch or salt and pepper and then slather the chicken with barbeque sauce once it's done. One of the best ways to add flavor to your chicken is to marinade them. Marinades can be done the night before, which frees up a lot of time and does not involve heating up your kitchen. Mix everything together in a baking dish large enough to hold the chicken pieces. Add the chicken and turn them to coat with the marinade. Let rest in your refrigerator overnight, turning occasionally. Grill over medium heat for 8 minutes per side for breasts and 12 minutes per side for leg pieces. Serve with salsa and barbeque sauce. Okay, this isn't an actual tandoori recipe, but it's close enough in taste and you can make it on a grill. Mash the garlic with a garlic press into a large bowl. Mix everything else into the bowl. Be sure the chicken is 170 degrees before serving. Chicken is one of the most versatile meats to grill. You can make chicken satay by just roasting them whole or whipping up a mess of wings. Be sure to have plenty of cold drinks on hand as well as salads and side dishes.